We love all things Paneer in our household. Wait, don’t give me that ‘it’s high calorie and unhealthy’ look. If you’ve been reading my blog from the start you would know I’m no stickler for ‘healthy’ stuff and enjoy all foods in moderation :) Chili Paneer, Mutter Paneer, Palak Paneer, Rasmalais, Rasgollas have run their course more times than I can count. My younger brother enjoys it a lot more than any of us combined. So this post is dedicated to Ju for his love of Paneer. 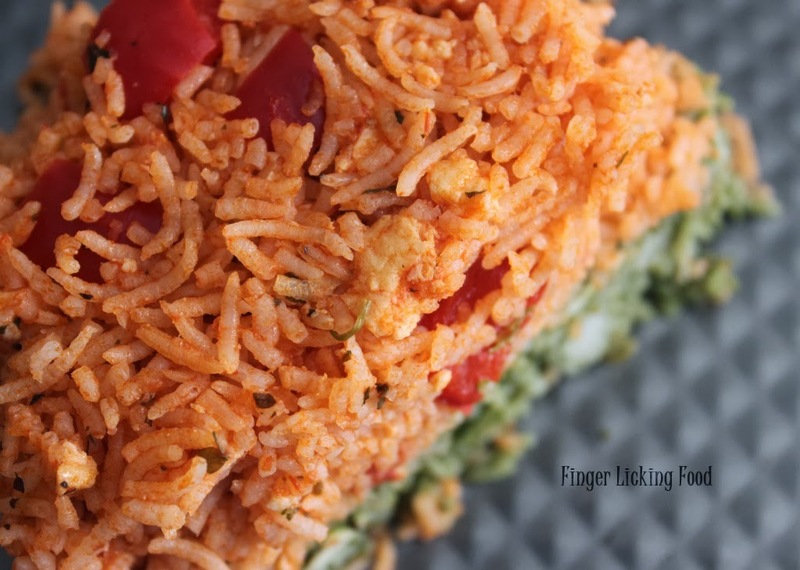 I was on the lookout for a different way to combine Rice & Paneer. I came across this recipe by Chef Sanjeev Kapoor. It’s a baked dish and uses very simple ingredients. I spruced it up a bit to suit our tastes, we like things spicy and flavorful. Trust me, this tastes just as good as it looks. Heat oil in two separate pans for the two layers. In one pan, add the cumin seeds and when they begin to splutter add ginger garlic paste and saute until fragrant. Add the chopped onions and cook until translucent. Now add the spinach puree, red chilli powder, salt to taste and Kasoori Methi. Saute for a few minutes until the oil begins to bubble to the top. Don’t cook for long since you want the bright green to stay intact. Stir in the crumbled paneer and lastly add the Garam masala. 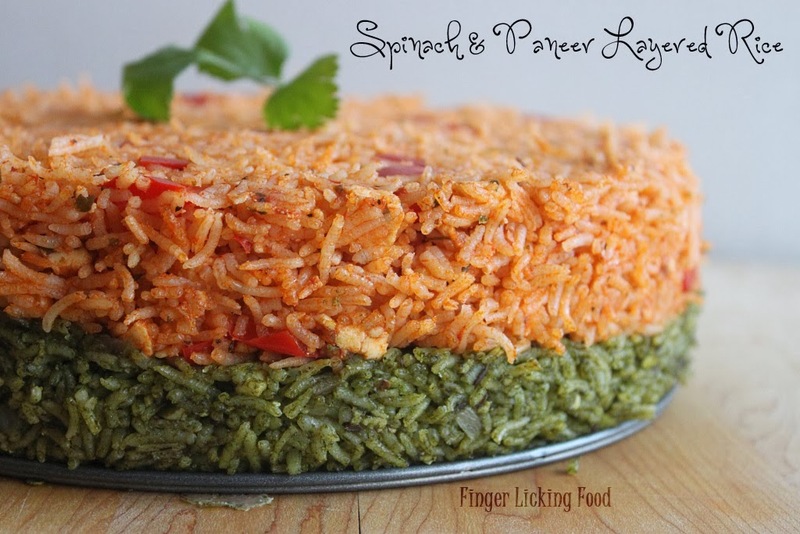 Add half the cooked rice (2 ½ cups) to the spinach mix and combine well. Turn off heat and set aside briefly. To the other pan, add the cubed bell pepper and cook until soft. Add the marinara, crumbled paneer and sugar. Add the kasoori methi and sugar. Bring to a simmering boil. Now add the remaining rice and season with salt. Combine to coat the grains of rice well. You can add more marinara if you feel the rice is dry. Now the layering part. The fun part. I used a 10-inch Spring form pan. A spring form pan has a bottom that comes part from the sides of the pan. This is widely used in layered desserts and to bake sponge cakes which are delicate and fragile. I have a non-stick spring form pan so didn’t need to grease it. If you don’t have a spring form pan, don’t go find one just for this. An oven safe glass bowl or dish will work just fine. 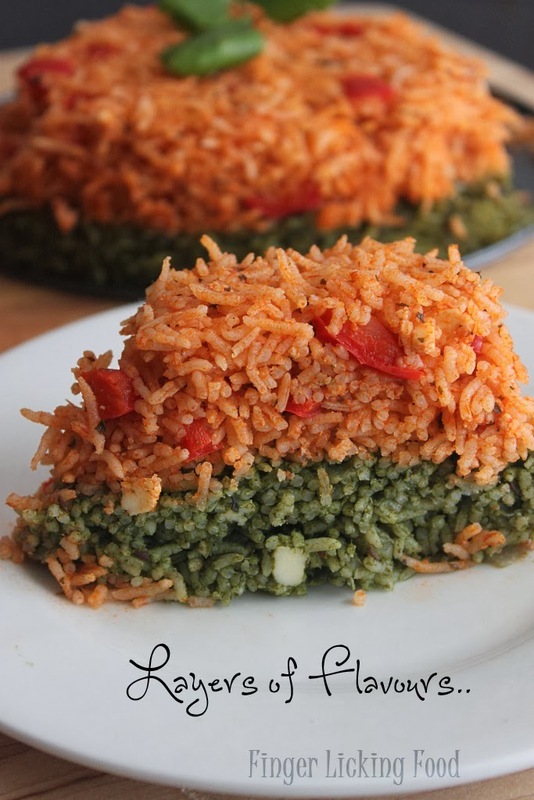 Evenly spread the green rice on the bottom of the pan compressing the rice using a spatula. This ensures it forms a layer that is firm and holds when unmolded from the pan. Top with the red rice in an even layer compressing again. Place filled pan on a baking sheet and bake in a pre- heated oven for 5-6 minutes. This process heats the layers thoroughly and brings the flavors together. Let pan cool slightly before trying to remove the ring (sides of pan). Do It slowly so as to not disturb the layers and you have a clean finish on the exterior. This rice is good eaten as is and needs no accompaniments. The paneer tastes refreshingly different combined with the marinara and the spinach flavored rice adds a nice touch of color. I know my brother is drooling looking at the rice, hope to make it for him someday. wow!! This looks very very good. I love the idea of using a springform pan. Great looking dish and sounds so flavorful! Love this! 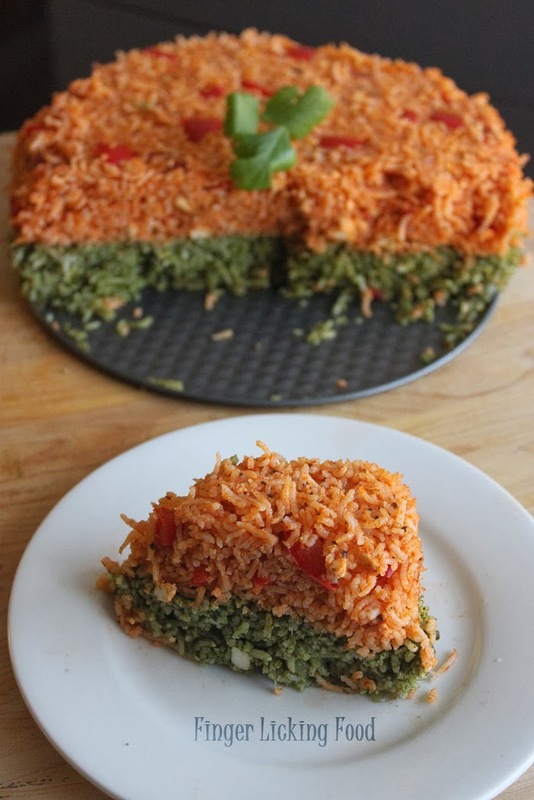 The colours and you used Marinara sauce in rice, that's wow... I can just imagine how it must taste, pretty awesome... Can't wait to try it!